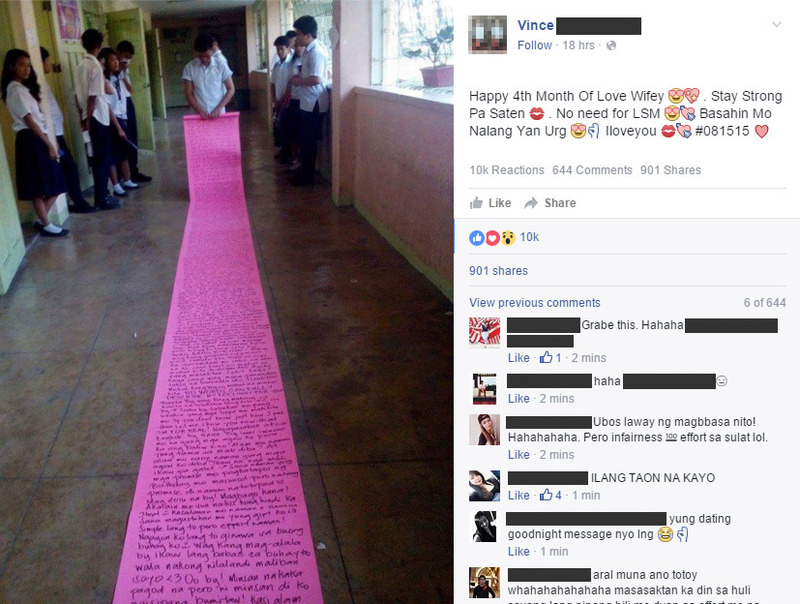 A high school student living in Pateros, Metro Manila, has written what is believed to be the longest monthsary love letter for his "wifey." Vince Joseph, who entered into a relationship with Creesleen Anne last August 15, posted a photo that shows the pink love letter being rolled out like a carpet. "Happy 4th Month Of Love Wifey. Stay Strong Pa Saten. No need for LSM. Basahin Mo Nalang Yan Urg Iloveyou #081515," his caption reads. The post has gone viral, garnering more than 11,000 Reactions and nearly a thousand shares on Facebook as of 9:20 p.m. Tuesday, December 15. It has also drawn mixed reactions from netizens, with some giving the teenagers an advice to finish studying first before getting serious with love.